We've all been in that situation where we've felt like the odd one out for being the only single one in our group of friends. It only feels like it could happen in the movies that if you're in a situation like that, you'd show a picture of your fake "partner" to your posse to convince them you're just as "relationship normal" as the rest of them when you're actually not. Well... Ookami Shoujo to Kuro Ouji shows us just that when Erika Shinohara finds herself in this sticky situation. So what is it with girls and bad boys? I have never understood the unusual attraction some girls have towards guys who are just flat out, dare I say it, misogynistic. I don't know, maybe it's just me. Well when Erika shows her friends a photograph of this mystery man she calls her "boyfriend," bragging how over the top their relationship is; little does she know that the photograph she showed was a picture of a fellow classmate. From then on things get... messy. That man in the photograph is named, Kyouya Sata decides to listens to Erika's story and decides to play pretend boyfriend with her. Only to find out that he'll play ball if Erika obeys whatever the man tells her to do. Sounds very funny and in the beginning I found the anime to be comical, with the whole idea of Erika being Kyouya's "dog" and whatnot. But then it got to a point where Kyouka becomes like one of those vampires in Diabolik Lovers, a super soft-core version. I didn't like Kyouya's demeanor throughout the entire anime, not even in the end since he still was uptight about everything- though he does have a couple of good moments on the show. Not a big fan of Erika either since she comes off as this presumptuous girl who seems to have it all but actually doesn't. It's not always that fun to watch a girl be disrespected and mistreated in anime, but hey, there were people who liked the Ookami Shoujo to Kuro Ouji. Now since this is shoujo you better expect a love rival. I think this is one of the very few times where I wanted the main character to end up with the love rival. If I remember correctly the love rival was Takeru Hibiya who's the complete opposite of Kyouka; nice, charming, chivalrous, and respectful. In my mind I would go for the love rival, but something went wrong in Erika's messy brain. The animation was pretty low quality in terms of what I'd expect the standards for these days. I would have preferred a bit more dimension with the animation rather than seeing everyone so planar. 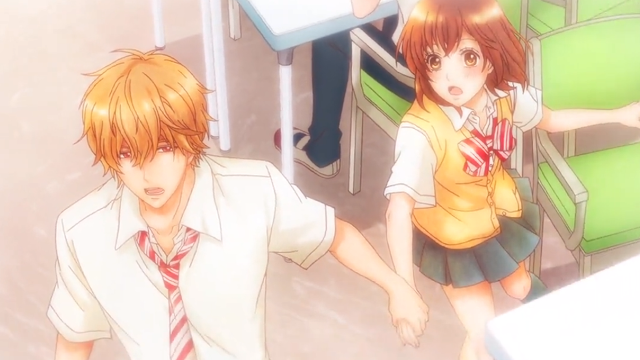 TYO Animations could have put a bit more work into the animation as well as the colour for Ookami Shoujo to Kuro Ouji. That's it for this review. It's one of the few times where I sort of not liked a shoujo anime as much as the others; I still enjoyed it for the most part but it left an aftertaste in my mouth. Mainly because the combination of the two main characters didn't mesh well together. An ego driven male and a desperate/ delusional female didn't make for the best combo to watch. Though I did like Kyouya's "trash" comment he made in one of the episodes, I thought that was sweet. Anyways, please leave a comment down below sharing your thoughts if you've seen Ookami Shoujo to Kuro Ouji.